We recommend that you make reservations or at least call ahead to be sure we can accommodate you and your family in the campsite or cabin of your choice. Pre-booked reservation confirmation letters went out March 1. To make a new reservation, contact us beginning April 15. Note: You must be 21 years of age or older to rent a campsite/cabin. 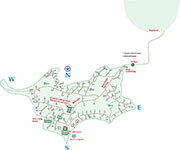 To check out campsite locations, click on the map below to see a larger version or download our brochure. A three-night minimum stay is required for all holiday weekends. Payment is by check or cash only. We request that campers pay for what they have reserved. 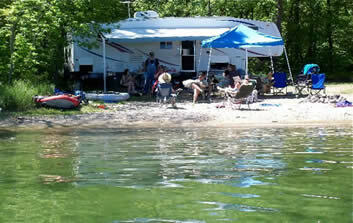 contact us about options for reserving lakeside sites. We allow one family/camping unit per site, unless prearranged with us. A family is considered a parent(s) and dependent children. Deposit of $50 per family per reservation per site required. Deposit of $50 per family per reservation per site is required. We allow one family per cabin, unless prearranged with us. A family is considered a parent(s) and dependent children. 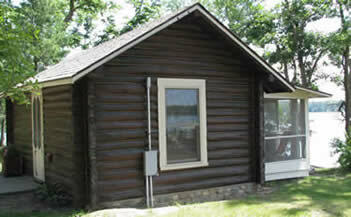 All campers and their guests must register at the office when they arrive. Balance due upon arrival. Payment is by check or cash only. We request that campers pay for what they have reserved. Reservations for six or more days receive preference for a specific numbered site. If you make a reservation for less than a week, you’re assured a site, but it may be the one requested or the one nearest to it. We allow one family/camping unit per site, unless prearranged with us. A family is considered a parent(s) and dependent children. If you're bringing an extra person(s) or a non-camping visitor(s) will be stopping by, see the section below. 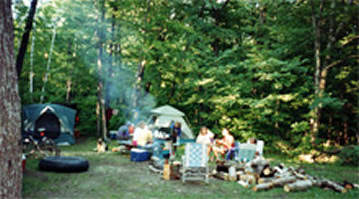 An overnight extra person(s) or non-camping visitor(s) is someone who is not an immediate family member (see above.) The charge for each overnight extra person or non-camping visitor is $10 per day. When making a reservation, please let us know what size/type of camping equipment you have such as tent, camping trailer, travel trailer, pick-up camper or bus so we can ensure that your site choice will work best for you. The maximum length of vehicles we can accommodate is 36 feet. We do not have water hook-ups, but you can fill your tank at our central shower facilities. Reservations will be held 24 hours. To receive a refund on your deposit, cancellations must be received two weeks prior to arrival. There is a $10 cancellation fee. Boat & motor: $36 per day (dawn to 8:45 p.m.) Plus gas & tax. Pontoon boat: $140 per day (9 a.m. to 8:30 p.m.); $65 per morning (9 a.m. to 12:45 p.m.); $95 per afternoon (1 p.m. to 8:30 p.m.) No grills or smoking allowed on the pontoon boat. The majority of our campsites have electrical connections. Please check the map.